Summer is a time for fun; school is out and the weather is perfect. But safety is important to consider whenever you leave the house. The warm weather increases the number of water related accidents and heat related illnesses. Other outdoor activities such as hiking also have safety concerns to make note of. 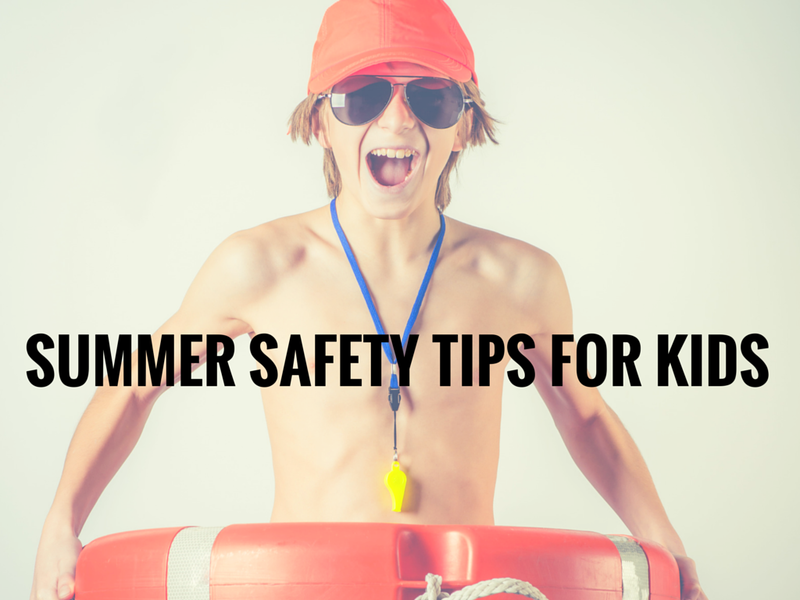 Water safety is an important topic for anytime of the year, especially during the warm summer months when more families are packing up and heading to the beach. It is crucial to keep safety in mind in order to prevent accidents. Swim in designated areas supervised by life guards: Drowning is the second most leading cause of accidental death in children between 1 and 14 years old. The major cause of drowning is lack of supervision and physical barriers. Wear life jackets on boats: Not using life jackets results in 90% of fatal boating related accidents; other causes are from trauma, carbon monoxide poisoning and hypothermia. Enroll your kids in Swim lessons: formal swim training can reduce the risk of drowning by 88% in children between the ages of 1 and 4 years old. Supervision:A responsible adult should be assigned to monitor. The monitor should not be involved in other activities such as reading, doing chores, talking or texting on a phone. Buddy System: Swimmers should never swim alone or without a lifeguard present. Swimming lessons help but this does not substitute close supervision. Learn CPR: This raises the chance for survival by treating victims before paramedics arrive. Avoid Alcohol: Supervising adults should avoid alcohol. Physical Barriers: Fencing around pools prevents young children from wandering into the pool area and drowning. Remove Toys/Balls/etc from the pool after use: Toys become an attraction for young children who may not be able to swim. Heat and sun exposure are real concerns during the summer when kids are outdoors more, and are involved in more vigorous activities. There are certain things to consider before sending your child outside playing for the day. Heat stroke: High temperatures coupled with active play in the sun with less clothing puts children at risk. Kids suffering from heat stroke appear flushed and have decrease sweating, rapid breathing and a rapid heart rate. Sun burns: Sun exposure can cause severe sunburns and increase the risk of skin cancer later in life. A cloudy day can be deceptive because UV light still pass through clouds and can cause sunburns. Drink plenty of fluids: Before, during and after activities. Wear light loose fitting clothing: Wearing light, loose fitting clothing allows for better air flow which can prevent your child from ever heating. Avoid being outside between 10am-4pm: The sun is at its peak during these hours; this poses increased risk of over exposure. Stay in shaded areas: Bring an umbrella to the beach or find a shady spot to set up. Wear Sunscreen: You should be applying sunscreen with at least a 15 SPF. NEVER leave a child in a parked car unattended. Stay Safe during your Hike! Summertime is a great time to go hiking and enjoy the outdoors. Unfortunately this is also the same time of year that insects are most active. When hiking it is best to stay on trails that are clearly marked and avoid going off trails into the thick brush. Potentially harmful insects could be living in thick brush, under rocks or in holes along the trail. Snakes like to avoid human contact so make a lot of noise and walk on top of rocks and logs to scare them off. If a snake bites you, call 9-1-1 and wash the bite with soap and water. Keep the bitten area below the heart; cutting into the bite and sucking out the poison is not effective. In some areas, scorpions are prevalent; they like to hide in dark areas like under blankets, in shoes, and clothes. So shake all items before using them. If a scorpion stings you, wash the area with soap and water and place an ice pack on the area. Young children and elderly adults should be taken to the emergency room for evaluation and treatment. Insects such as mosquitoes, fleas and ticks can not only be a nuisance but also carry diseases like West Nile Virus, plague, and Lyme disease. The best way to avoid these diseases is to apply an insect repellant that contains DEET. DEET should not be used on infants, instead consider using oil of lemon eucalyptus which is non-toxic. Bees are especially active during the Spring and Summer. Avoid wearing perfumes and scented lotions while enjoying the great outdoors. Dress in neutral colors and avoid wearing bright clothing or anything with floral prints as these items are more attractive to bees. Bees sometimes climb into open cans of sugared beverages and can sting the drinker if they are not careful, make sure to close containers after every use. Bee Stings: If stung by a bee gently scrape the stinger off with a credit card. Do not pinch the stinger and attempt to pull it out; it will inject more venom into your skin. Apply ice to the area; this will slow down the spread of the venom. If a bee lands on you: Do not swat it away. Gently blow on it to encourage it to fly away. If a swarm of bees attacks: Cover your face and mouth and run towards a building or shelter to hide. Jumping into a pool is not effective because bees will wait for you to come out and attack again. Seek medical attention if: You experience difficulty breathing, lip swelling, or dizziness. Summer time is a great time to have fun outdoors but taking a few precautions can keep your family safe. Dr Desmond Lew is a Board Certified Pediatrician in California. He received his Medical Degree in 1989 at Hahnemann University School of Medicine in Philadelphia. His Pediatric specialty training was based at University of California, Irvine Medical Center, where he rotated through UCIMC, Children's Hospital of Orange County and Miller's Children's Hospital in Long Beach.